Before I was able to buy my sewing machine, I spent a lot of time on the internet getting inspired thinking about all the beautiful clothes I wanted to make and learning the theory of how to sew. Without doubt, the best resource I came across was Tilly and the Buttons, in particular her learn to sew series. So Tilly’s Miette skirt (specifically designed to be beginner friendly) became the clear choice for my first garment make. I would absolutely recommend this pattern, especially to beginners. Tilly has provided very clear step by step instructions with pictures to guide you along and what’s great is you can review these before buying the pattern so that you are confident you’ll have everything you need to put it together. 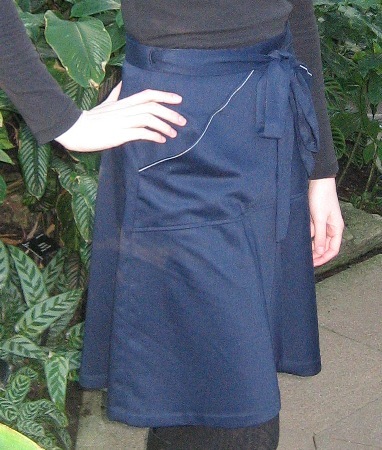 The fabric is a lovely soft navy blue cotton twill from Goldhawk Road. Very happy with the fabric, but it took two trips to buy it – on my first trip I was so overwhelmed by all the different fabrics and lack of labels that I came away empty handed! 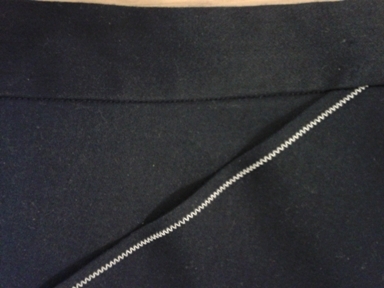 I top stitched the pocket openings with a short and narrow zig zag stitch in white for a bit of contrast detail. 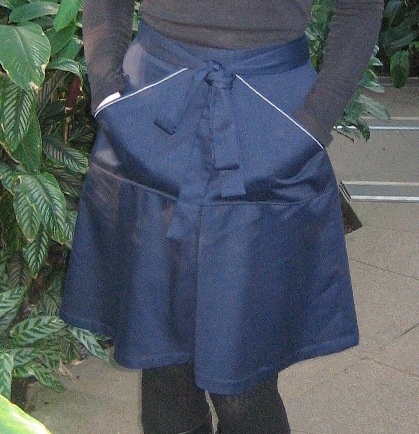 While the waist ties mean this is not my usual style of skirt (since they force you to tuck tops in), I love the shape of this skirt and will definitely get good wear out of it. I’m keen to make another version converting the waist ties into button tabs so that it is more versatile in my wardrobe (but need a bit more practice of the basics first!). Thanks Caroline 🙂 The lovely photos on Tilly’s site really helped with making this skirt well.